This 3-inch glass ornament will be a keepsake for all. It makes a special gift for family and friends. Profits will be used for upkeep and improvements for the Bandshell. 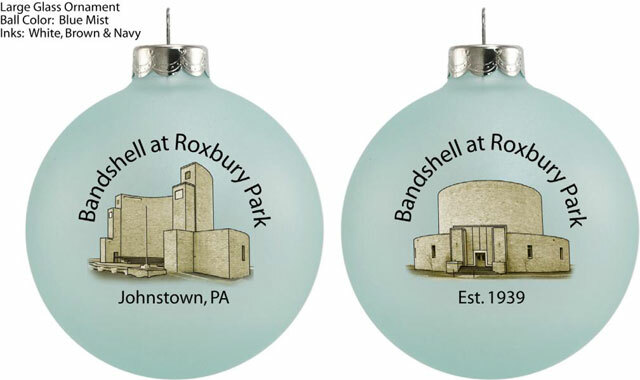 The Roxbury Bandshell built in 1939 located at the Roxbury park in Johnstown PA, born in the great depression, was built as a tribute to the strength of the Johnstown people and their determination to survive the depression and to build a better future. This magnificent rock-strong Bandshell was filled with songs of hope and optimism, where entertainment could uplift people fighting through the economic struggles of their day. If the red flags are flying at the shell please note that signals cancellation of performers for that particular day.